Key Retention Builder… helps you build you ability to hold onto a “key center” through targeted singing exercises. Key Retention Builder refines two crucial steps in your ear training skills. Develop your key retention and improve your aural comprehension of the most common key centers. Developing a strong sense of key in modes that are generally problematic for most musicians. Developing key retention in commonly used modes. If you are not familiar with these modes then we recommend Essential Scales book as a way to understand and apply the scales. Advanced modes are also covered. There are also a set of 12 tone melodies included that will help you bridge the gap between commonly used modes and the more advanced harmonic situations frequently found in contemporary music. The idea is to slowly wean you away from having to hear a drone as a key reference and have the key center become a natural part of the way you hear. To do this you will work on each set of singing exercises and slowly remove the drone until you can hear a cadence and then sing all the way through any exercise in this book by only getting a key reference to start. Key Retention problems are common among musicians. The ability to internalize a key center in a natural way. less dependence on having a key center reinforced. If you haven’t already, it’s time to expand your ear training exercises. Congratulations on passing on to a higher level in our ear training course! Now that you have started on Key Retention Builder. If you haven’t already started working on Direct Application Ear Training, Melodic Ear Training and Melodic Ear Training now is the time to get started. Remember Bruce Arnold is here to help you through the process. Now that you are moving into the more advanced levels of Ear Training it is important that you check in every few months so Mr. Arnold can check on your process. It’s easy to go off track with the ear training so keep in touch and make sure you are improving at your fastest pace. 14 pages with 4 CDs of audio files with physical version and 4 CDs worth of MP3s with the digital version. I have to say I’m fascinated with Muse-eek.com’s Ear Training system. From some email exchanges with Mr. Arnold I believe that it goes something like this: You have to first learn how to hear each note in a key center without using any tricks. Once you are starting to get around 50% correct answers with the one note exercise you expand out into real music exercises to strengthen your ability to hear one note in various contexts. That overall idea of get 50% ability and then expand to real musical exercises continues as you move through various levels of the ear training. Once you have 80% with the one note exercise you move on to Key Note Recognition which is really hearing the one note in a different context. Again 80% on any exercise move on to the next level. You can also at that point throw in melodic ear training once you are getting 80% correct answers with the one note exercise. After Key Note Recognition you move into the Ear Training Two Note and add in singing exercises like Key Retention Builder and Lines Volume One: Sight Reading and Sight Singing Exercises. I love this concept of clinical exercise then real musical exercise. I haven’t found any other ear training methods that is this well thought out and prepares a student for the use of ear training in real musical situations. Also having access to Mr. Arnold has been a real plus. He’s probably getting tired of hearing from me but he has really pointed out a lot things that I was either doing wrong or didn’t fully understand. I should also mention that in my opinion the 25 Ear Training Tips is a must own. I almost felt like Bruce was using me as an example when he made those videos. All the questions I had asked him in emails were answered in those videos. Sorry to go on and on here but I thought I’d share my experience with muse-eek.com’s ear training method. I couldn’t recommend it any higher! P. Halloway. Key Retention Builder is an excellent idea. You need to know and hear multiple types of key centers and what better way to prove you hear it than being able to sing various notes in that key center. Singing notes in a Locrian, Altered, and Symmetrical Diminished key center literally took me months of work. I contacted Bruce about the exercises with this book and he also recommended singing through the book with MetroDrone audio files. First singing one note per https://muse-eek.com/?page_id=35&prod=1359 sound and then two, three or four notes. I’m still working on that for some of the harder key centers. Bruce also recommended the Jam Tracks Volume One, Jam Tracks Volume Two and Jam Tracks Volume Three to use as backing tracks and then sing. Bruce said that singing through these exercises with the Jam Tracks will really help me to hear those key centers in a real musical situation. Some of Jam Tracks are easy but, Locrian, the modes of Melodic Minor Ascending and the Symmetrical scales are quite hard. Muse-eek.com just released Jam Tracks Volume Three so I’ve been working with those grooves and singing the exercises. Using all the aforementioned practice ideas really points out to me my weaknesses. I have to say though I’m feeling my ear is much quicker at identifying notes within unusual key centers. I also feel that when I’m improvising that I’m really hearing what I’m playing so I highly recommend this book! F. Zummo. I was having a real difficulty with the 2 Note Ear Training and Mr. Arnold recommended I work with the Key Retention Builder. With 2 Note Ear Training Modulation becomes the key to success. My modulations were all over the map and I’d frequently get the right relationships but in the wrong key. Key Retention Builder really help me understand multiple types of key centers and help me rely less on a constant reinforcement of a key center. It also taught me volumes about the sound of key centers like Symmetrical Diminished and the Melodic Minor Ascending modes. Very useful exercises! K. Galloway. I’m a intermediate/Advanced Jazz Sax player. This book really helped me hear key centers that weren’t your simple major or minor. Key centers like a Lydian #5, Mixolydian b2,b6 were completely foreign to me. This book really helped me the hear correctly when I playing in these types of key centers. If you are having the same problems this book will fix it. W. Rowland. I just finished this book. Took me about a year to get through it. The 1st few pages took weeks. It got quicker after that but some of the key centers were very tough for me. The Diminished and Whole Tone were real bears to get down. I feel that my ability to hear music has been fundamentally changed from the exercises. For instance I could never hear a Locrian Key now I can and identifying notes within that key is simple now as opposed to before I didn’t have a clue. Highly Recommended. T. Velazquez. 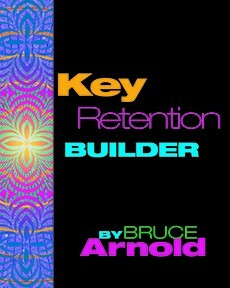 Get Key Retention Builder today and transform your sense of key. What should I work on after Key Retention Builder? This entry was posted in Ear Training and tagged ear training, key center, key retention by Muse Eek. Bookmark the permalink.